Want to see OpenQuest in action? Head over to http://www.therpgsite.com/showthread.php?t=18104 and have a read through Pseudoephedrine‘s In Search of Folly play by post game. This train of thought started with me thinking about the infamous Appendix N (the section of the 1st Ed Dungeon Masters Guide which listed all the books that had influenced the development of D&D). Of course everyone knows that Appendix N stands for Appendix Newt, but they are just too scared to admit it 😛 But seriously folks there will be an Appendix N in Crypts & Things, since I think its important (and fun) to show the game’s influences. Initially I thought that I’d put it in the Crypt Keeper’s chapter (notes from the Abyss), then I thought that it would be more fun (and Old Skool) to actually have an Appendix N, in a series of Appendixes at the back. Then the more I thought about it the more it made sense. Both AD&D 1st ed and my beloved RuneQuest 2 have copious Appendix sections, where a number of misclanous topics are address as well as giving very brief and to the point GM guideance notes. So this is the road I’ll be going down with Crypts and Things. 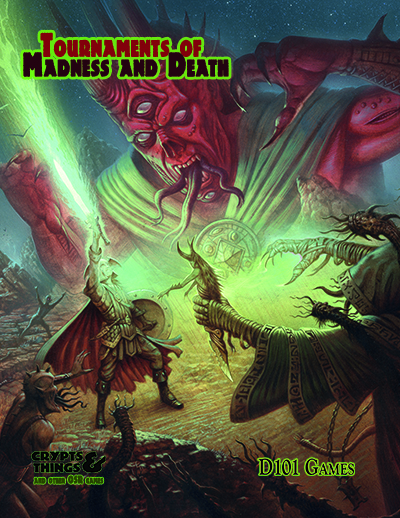 As well as my version of Appendix N, there will be appendixes that detail Crypt Creation, the Weirdlands, a City Events table, a random stuff table (which includes tricks and traps) as well as some other topics, see the list below. E. Who is thine Enemy? John Ossoway is nearing completion of River of Heaven, and we need playtesters to give it a good run though. It is the dawn of the 28th Century. The Third Renaissance, or Bright Age as future historians will call it, is at its zenith. After the catastrophic first contact with extra-terrestrial life that led to the horrific Solar System war, humanity clawed its way back from the brink and finally reached the stars. For millions of people, Earth’s sun is no more than another star in the night sky, a mote of light, a spiritual birthplace that they will never visit in their lifetimes. River of Heaven uses D101 games’ OpenQuest rules engine; a sleek and streamlined D100 rule set that enables you to maintain the tempo of your stories whilst keeping the rules simple and in the background. Crypts and Things has gone to playtest! This morning I sent out the current draft of Crypts and Things to those people who answered the initial call for playtesters. This is my Swords & Sorcery RPG!